Dutchie Backhouse, Mayor of Woollahra, 1978-9. 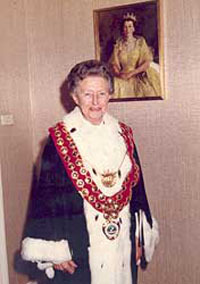 Elected in September 1978 as the first woman mayor of Woollahra Council, Brenda Backhouse was only the third woman elected as an alderman on Woollahra Council, in September 1971. Born Brenda Somerville in Sydney on 8 April 1912, ‘Dutchie’, as she became known, was one of three daughters of Lieutenant-Colonel George Cattell and Brenda Elsie Somerville. Brenda's nickname 'Dutchie', which began at school, seems to have originated from her mother's maiden name of Holland. George Somerville served in the AIF during World War I and the Somerville family moved to England during this time. After the War, the family returned to Australia and settled in Melbourne. A few years later the Somervilles moved to Sydney when Colonel Somerville was appointed Secretary of the Royal Agricultural Society of NSW in 1924. The family lived at the Showground residence, Rawson, on Driver Avenue, Moore Park. As a girl Dutchie attended SCEGGS Darlinghurst from 1925 to 1927. After leaving school she enrolled at the Australian College of Physical Education, graduating from the ‘Sword’s Club’ in 1931 with a Diploma in Teaching as a ‘Physical Culture and Sports Mistress’. She began her teaching career at Kambala, Rose Bay in 1933 as the Physical Education Mistress. The Principal at the time, Fifi Hawthorne, described her as an ‘enthusiastic teacher’ encouraging in the girls a ‘great upsurge of keenness’ (Hawthorne, p. 110). Brenda left the school at the end of 1938, prior to her marriage to John Paxton Oscar Backhouse in 1939. 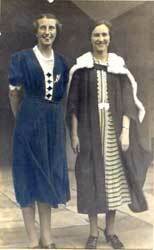 Dutchie Somerville, Sports Mistress and Fifi Hawthorne, Principal at Kambala, 1933 (Kambala Archives, Kambala). With the outbreak of World War II, John Backhouse enlisted and Dutchie and John spent the first years of their marriage living interstate. Dutchie returned to live in the Eastern Suburbs before the end of the war, with John joining her after the war ended. John Backhouse then worked for York Motors in the city. In 1959 Dutchie and John with their three children, George, Brenda and Peter, moved to the Backhouse family home in William Street, Double Bay. Although Dutchie had retired from teaching in 1938, she continued her involvement with education. She joined the Double Bay Primary School Parents and Citizens when her children attended school there and her membership of the Federation of Parents and Citizens Association of NSW would continue for 30 years. She served for a number of years as state president and was an enthusiastic advocate for greater parental involvement in schools. Dutchie was a member of numerous committees including the NSW Roads Safety Council, the Education Advisory Commission and the Australian Local Government Women’s Association. As well as her work for the wider community, Dutchie was actively involved with the local community, supporting in particular, the needs of children, the elderly and sporting bodies. In 1979 she was elected chairman of the Woollahra Voluntary Community Services. She was also chairperson of the Woollahra Senior Citizens Welfare Association. Dutchie maintained her enthusiasm for sport throughout her life. She and her husband were founding members of the Double Bay Sailing Club which was formed on July 13 1956. Dutchie held the position of president for some years. After her death and to commemorate her involvement with the Club, a rescue boat in her name was commissioned. The ‘Dutchie Backhouse’ was officially launched at the Double Bay Sailing Club on October 25 1986. 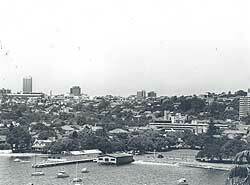 Double Bay Sailing Club, c1976. Dutchie also joined the Double Bay Women’s Bowling Club after attending the opening of the club in 1979. She became the second president of the Women’s Club in 1981, a position she held until 1984. In September 1971, Dutchie was elected to Woollahra Council as a representative of Double Bay Ward and a candidate of the Woollahra Action Committee. As well as being elected the first female mayor on Woollahra Council in 1978, she was also the first woman elected to the position of deputy mayor in 1975. She served again as deputy mayor in 1977. Another ‘first’ was becoming the first woman to chair a council meeting on 24 November 1975. The mayor at the time, Alderman John O’Brien arranged for Dutchie to take the chair ‘as a tribute…to International Women’s Year and also to Alderman B.S. Backhouse as the first lady to hold the office of deputy mayor of this council’ (Wentworth Courier 3.12.1975, p.1). Dutchie served on various committees on Council, in particular Community Services, Building and Health, Finance, Town Planning and Public Environment. She served on various special committees such as the Beautification of Double Bay, the Woollahra Senior Citizens and the Holdsworth Street Playground, reflecting her particular interests in conservation, children and community services. In 1976, Dutchie was quoted as saying ‘I think my greatest satisfaction so far has been the rebuilding of the Holdsworth Street Children’s Playground and its extension to include fuller community activities’ (Wentworth Courier 10.3.1976, p.4). 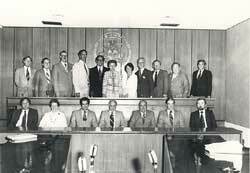 Dutchie retired from Council preferring not to seek re-election in September 1980. Her hard work and no-nonsense approach during her eight years on Council earned her the respect of her colleagues and her example encouraged other women to seek election to Woollahra Council. Dutchie Backhouse, Mayor, at a meeting of Woollahra Council, 1978-9. A forthright and energetic woman, Dutchie was admired for her strength of character and ability to communicate with people. Dutchie dedicated her life to community service and her determination and commitment ensured a greater awareness of the needs of the community, in particular the elderly and children. Her tireless work for the community was officially acknowledged when she was awarded the British Empire Medal for community service in June 1973. Dutchie Backhouse died on 21 October 1985. She was survived by her children, George, Brenda and Peter. Sound excerpts taken from an interview recorded by, Frank Heimans, February 2007 with Peter Backhouse, son of Dutchie Backhouse, and Mike Regnis, former General Manager of Woollahra Council. Haken, J.K., ‘Somerville, George Cattell (1877-1959) Australian Dictionary of Biography, Volume 12, Melbourne Uni Press, 1990, p.14.